Everybody loves getting more bang for their buck, which may explain why most digital cameras offer scads of functions. However, the more features that are packed into a camera, the more difficult it is to use the camera. There may be so many features you have no idea what most of them do when to use them, or how they affect your pictures. Removable Memory Card: All but the most inexpensive digital cameras save images to memory cards, whose capacity can vary widely. When you run out of space, it takes only seconds to pop in a spare card. To transfer pictures to a computer, remove the card and slide it into your computer's memory card reader. Anti-Shake: Even the steadiest of hands aren't completely still when pressing the shutter button, which can produce blurring, streaks or soft focus when shooting in low light or when maxing out your telephoto lens. Anti-shake (image stabilization) helps neutralize jitters to produce sharper images. Many cameras allow you to turn off this feature, but it's a good idea to leave it on at all times. Burst Mode: This function allows you to take multiple shots in rapid succession like a pro's motor drive so you won't miss that all-important action shot. The lag time between taking each image varies widely. Macro Mode: To capture detailed close-ups, such as an insect on a flower, use macro mode to focus within inches of your subject. How close you can shoot varies from one camera to another, so read the documentation before buying. Autofocus: Even professional photographers tend to keep their cameras on autofocus. As long as you understand how it works by recognizing the area(s) of focus within the camera's viewfinder, autofocus is usually better than manual focus. Auto Exposure: Making sure that you capture the right amount of light is key to good photography. Auto exposure makes decisions for you regarding relevant settings such as shutter speed and f-stop. Focus-Assist Lamp: A camera lens can't focus in a dark room. Pressing the shutter halfway on many cameras produces a red or green light or a series of preflashes that provide just enough illumination for a camera's auto-focus function to work properly. Face Recognition: By identifying faces in your picture, this feature provides optimum exposure and focus for portraits or group shots. Best-Shot Selector: A camera may display several versions of a picture, either shot milliseconds apart or using a variety of color or exposure settings. You select the one that you like best. Shooting Modes: Many cameras offer several preset modes for shutter speed, f-stop, and focus, appropriate to a variety of special situations like a beach, fireworks or a moonlit landscape. AutoCorrect: For even greater versatility, you can adjust a picture's exposure, color, and in some cases, shadows. Touchscreen: If you prefer to not to bother with buttons, touchscreen controls, in which you use your finger or a stylus, can be more intuitive and quicker to use. Aperture and Shutter Priority: Good exposure requires balancing the amount of light entering the camera (aperture or f-stop) with the duration of exposure (shutter speed). With aperture priority, you select the f-stop you want, and the camera will automatically choose the shutter speed that will give you optimum exposure. 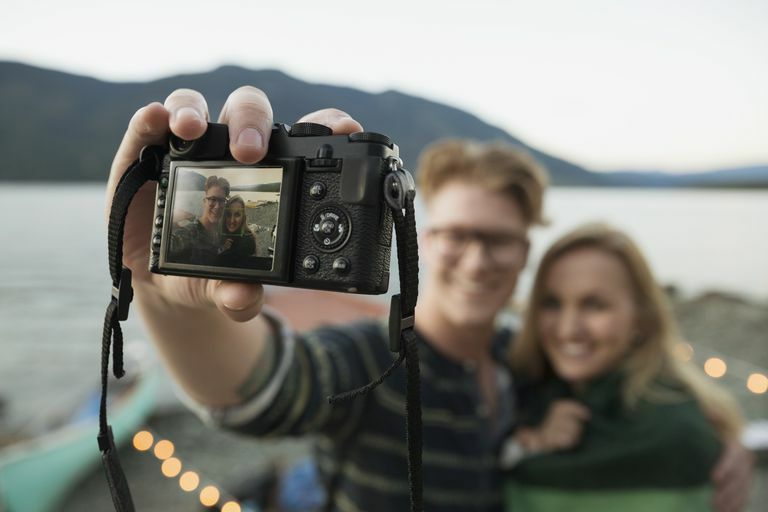 With shutter priority, you set the shutter speed, and the camera selects the appropriate aperture. Manual Exposure: By uncoupling shutter speed and aperture, you can use your knowledge of photography and select the right exposure, which is particularly useful when shooting in mixed light or when you want to experiment with exposure. Manual White Balance: A powerful tool, white balance allows you to define what the camera "sees" as white, thereby eliminating any color shift caused by the ambient light. Incandescent (indoor) lighting and sunlight require different white balancing. Manual Focus: Sometimes, your camera's auto-focus function will lock in on the wrong focal point or subject. Manual focus allows you to take control of that all-important aspect of your creativity and composition. Video: Most cameras offer low-resolution video capability that's appropriate for the web. Better cameras feature higher frame rates and full-frame size. Time Lapse: Set up your camera on a tripod to take a series of pictures over a period of time. Voice Recording: Use your camera to save conversations, memos about your pictures or to capture the sound around you. Panorama Assist: Frames in your viewfinder capture a series of pictures that can be stitched together using computer software into a panoramic view of a canyon or skyline. Wireless Remote: This is handy for self-portraits. Text Tagging: You can add captions or keywords to your picture files to identify them. Slide Show: Show compilations of your pictures on the camera's screen or an attached TV or computer. With some cameras, save the slideshow and share it. Wireless Connectivity: If you want to send your photos to an email address, website, or to a computer or printer, wireless connectivity is the ticket. Red-Eye Preflash: A series of preflashes supposedly reduces red-eye by closing your subject's pupils, but all it does is annoy people and make them move out of pose because they think the picture has been taken. Red-eye removal tools available in a camera's playback or photo editing software are preferable. Digital Zoom: Digital zoom merely spreads the pixels apart to appear to extend your telephoto lens while causing significant image degradation.